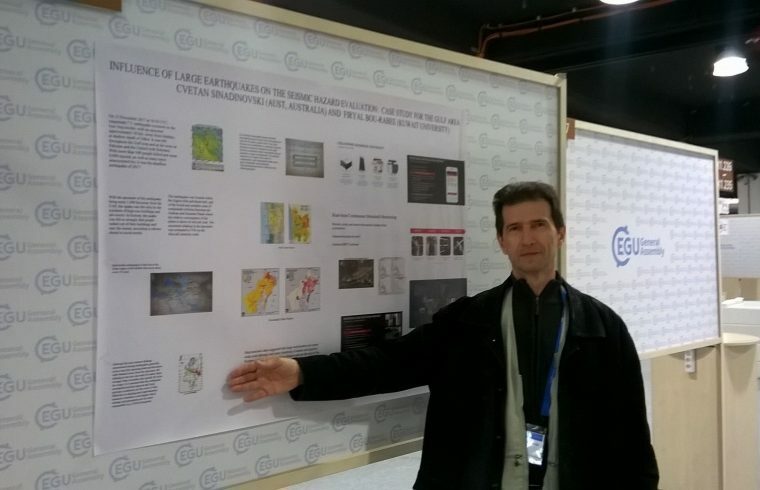 The 2018 European Geosciences Union (EGU) Assembly was held again in Vienna between April 8th and 13th this year. Over 15,000 scientists from 106 countries participated in the conference, of which 53% were under the age of 35 years. Some 4,776 oral, 11,128 poster and 1,419 interactive presentations were shown during 666 scientific sessions, 68 short courses and 294 side events. Australia as usual was mainly represented through the research work of the Universities. Some of the major topics under Seismology were: Earthquake sources, Engineering seismology and probabilistic seismic hazard, Seismic imaging across scales, Seismic instrumentation and infrastructure, Deformation, faulting, and earthquake processes, Computational and theoretical seismology, Crustal fluids and seismic activity (incl. induced and volcano seismology), Real-time seismology and early warning etc. The lectures had big audiences, for example the Beno Gutenberg Medal Lecture by Haruo Sato from Japan. Many plenary sessions comprised of Environmental issues which indicate today’s trends and expansion of the more conventional applications in Geosciences. A follow up of last year’s data analysis was presented based on the 2016-17 Central Italy seismic sequence. Those outcomes could be impacting European Seismic Hazard and Risk Assessment of disasters, preparedness planning and building protection programs. The Interplay between Earthquakes, the Seismic Cycle and Long-term Deformation: Models and Observations. The knowledge of these Hazard and Risk Assessments is applicable in the projects’ designs in Australia and the neighboring countries such as PNG. To summarise, the EGU 2018 General Assembly is the largest gathering of professionals and exhibition in Europe that brings together thousands of world-wide geoscientists into a meeting covering all disciplines of the Earth Sciences. A special publication of the articles is prepared for June this year. Further specific details about the conference and planning can be found under the EGU’s official website www.egu.eu.